Not motorcycle releated, but important to me. | I JUST WANT 2 RIDE!! It is not often that I post about a topic that has nothing to do with motorcycling but this is important. In my day job, I have been working in the Information Technology for many years. I do my best to keep up with the trends, changing technology and the laws that affect that technology. 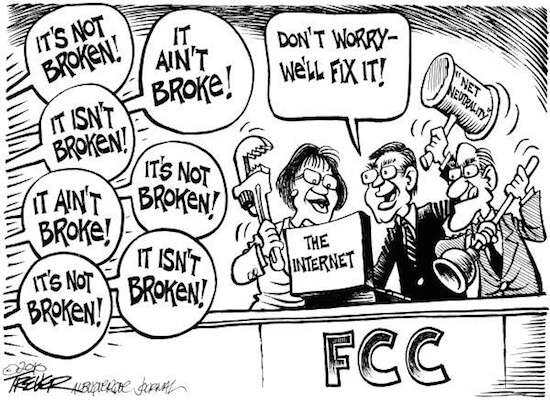 It is my opinion that the Internet (and thus all the industry around it) as you know it is about to be smashed by the FCC and their “Net Neutrality” rules. I came to this conclusion myself a few months ago as I read the pros and cons of what was happening with the regulations proposed by the FCC. These new rules (not passed by congress) are going to change the way you use the internet and thus your technology (TVs/tablets/phones/everything). They, the new rules, are also going to raise the price you pay for your internet and technology. I have struggled on how to pass this information on as it is a very complicated issue. A few days ago I ran across this article which explains the issue in a manner that I think all can understand (and better then my first attempt 🙂 ). Bottom Line – Net Neutrality is going to be BAD FOR THE AVERAGE AMERICAN. Government is trying to “fix” a problem that does not really exist and take more of your money in the process. Look at the taxes and fees on your cell phone bill and add that on your internet bill and on every device you purchase in the future (that would include TVs and anything else that connects to the internet). While it is HIGHLY unlikely that our politicians will listen to us I suggest that, after you look into it for yourself, you let them know this is just wrong. We have a saying over here. When the USA sneezes, Australia catches a cold. I think at this point in time America has the Flu…. We are hoping for a cure.! There is no cure. The flu comes ’round every year, as a different, more dangerous strain. Just like our politicians.